The death knell for BlackBerry has been sounding for months, but it appears the end for the former icon is truly imminent. BlackBerry announced its preliminary quarterly financials on Friday, and the news was a brutal triple-whammy. BlackBerry confirmed rumors that it will lay off a whopping 4,500 staffers by the end of the year. The company also warned of a stunning $1 billion quarterly loss (three times worse than than analysts expected). And BlackBerry said it plans to offer just four smartphones going forward instead of six. Shares of BlackBerry (BBRY) fell 5% Monday after tanking 17% on Friday. But perhaps the biggest indication that BlackBerry is going belly-up: The company said it is finally giving up on the consumer market it long ago ceded to Apple (AAPL) and Google (GOOG). Instead, BlackBerry will focus on corporate customers and "prosumers" -- professional consumers who are also increasingly opting for iPhones and Androids. Those are the only markets that offer BlackBerry the slightest glimmer of hope, and it's doubtful that the opportunity there is big enough to save the company. 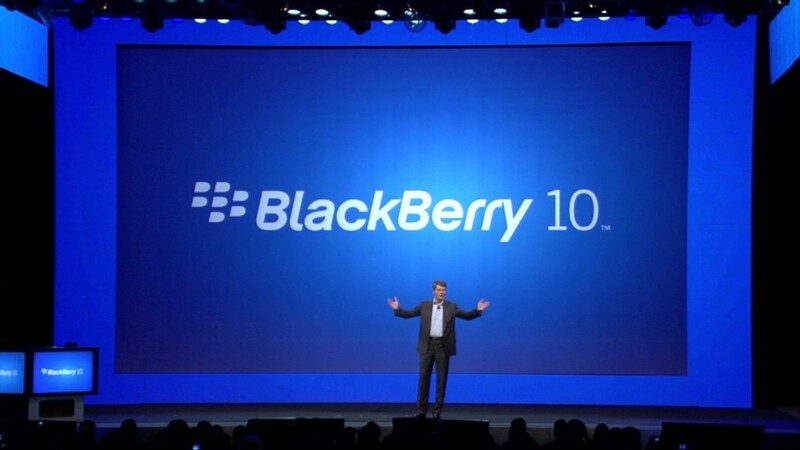 BlackBerry 10 flop: The consumer business has long been a losing battle for BlackBerry. A lack of innovation has led to a sense that the company is behind the times, which means the brand name no longer holds cachet with consumers. In turn, the top app developers have largely abandoned the platform. BlackBerry's consumer struggle came into sharper relief with the disappointment around Blackberry 10, the operating system that was meant to save the company. The software's release was delayed several times -- and so were the phones built around the new platform, which left BlackBerry customers with no new phones to buy. BlackBerry 10 finally launched in January, but sales of the new phones have sorely disappointed. BlackBerry 10 and the new phones proved to be merely solid offerings that felt a bit like .... well, what rivals were selling a year ago. With this last-ditch effort turning out to be a flop, BlackBerry's board of directors announced last month that it is considering "strategic alternatives" to boost the company's value and sell more smartphones. Options running out: BlackBerry CEO Thorsten Heins has said for months that the company would potentially be open to a sale of the entire company, but that doesn't mean anyone would be willing to buy. What's more, analysts are skeptical that BlackBerry's hardware business would be worth anything to a potential buyer -- and Heins indicated this summer that he isn't willing to make the company software-only. It's unclear whether Heins has changed his mind on that point over the last few weeks, but BlackBerry does possess attractive assets outside of hardware. BlackBerry still holds a strong reputation for corporate security, and the company offers several cross-platform solutions in that realm. Corporate-focused apps that work on iOS and Android devices could help BlackBerry piggyback on a bit of its rivals' successes. The company has also been planning to release its BBM messaging service on Android and iOS, but said on Monday that those releases would be delayed. Another non-hardware bright spot for BlackBerry is its trove of valuable smartphone patents. Its portfolio would give any buyer a massive advantage in the competitive and highly litigious world of smartphones. Just look at the never-ending Apple v. Samsung lawsuits. But implementing any of those options would take time and money, and BlackBerry is running out of both. BlackBerry had $2.6 billion in cash on hand at the end of the second quarter, but that was $500 million less than the previous quarter. As BlackBerry burns through the days and the dollars, analysts' predictions are bleaker than ever. Kris Thompson, a National Bank Financial analyst, predicted on Monday that BlackBerry's subscriber base will dwindle to 0 in the next two to three years. It looks like a whimper of an end for BlackBerry.